A tiny Goblin knocking out a mighty Dragon with his bare fists is impossible, you say? Not so in Cheaty Mages! You are a mighty Mage and want to have some fun and more money than you can spent … so what do you do? Go to the Arena and “help” your champion a little bit to win your bets! 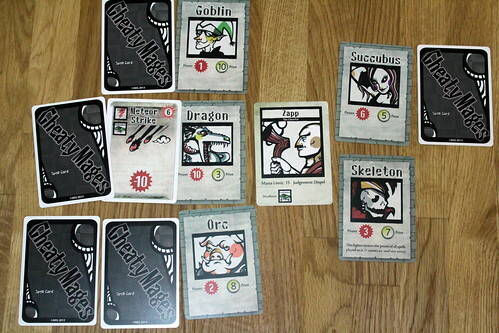 Cheaty Mages is a card game in which your main goal is to hoard the most money. In order to ensure your victory, you have to cast your spells on the five fighters (all horrible monsters in their own right) in the arena. It is up to you (and your drawing luck) to help your favored fighter and hinder the others. There he was again. In the great Arena of Nevergreet. This time Larry Leipzig would get his share of the winnings. Most of his arch-rivals like Bumdlebore and Papa Yogi weren’t there. He found his favorite place to watch the fights and sat down. Soon the arena would be full of fighters and bloodshed but at the moment it was nearly empty. Only the announcer Nilrem “the Worst” (magician of all times) was there to not greet the spectators. For greeting someone in Nevergreet was a very rude statement. Larry looked around and to his horror found other mages in the filling ranks of spectators. Wincerind, Rina Reverse and Jaina Meekmoore were there. Even Lorgana the Stray would bet. This wasn’t like he expected. But he couldn’t do anything now. He would have to wait and hope. No! This time he would win! Each game has three rounds. Each round has nine steps. Sounds complicated to you? It really isn’t. The first three steps are more or less only the setup: Determine the starting player, draw fighters and draw the judge. 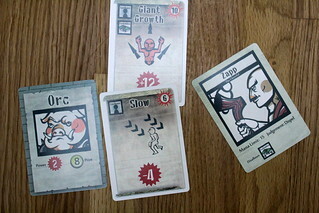 The setup of the game depends on the number of players – depending on that number cards are drawn. Nilrem stomped his staff on the ground and the arena became silent. All eyes were on the mage and the fighters entering the arena behind him. First in came the fat and lazy Orc. Nobody in his right mind would bet on him. Only a Goblin would have less chance to win. The next contestant was a blurring form which only became clearly visible after it stood beside the Orc. A Ghost! That could be interesting. It was followed by a Dark Elf and a Minotaur. The crowd was already cheering. Two of the fighters were heavy hitters. But who would be number five? The crowd was beginning to get restless. Waiting wasn’t their strong suit. Then exclamations like “Wow!” and “Oh my god!” erupted from the crowd. Nilrem seemed to be kissing the last contestant… a Succubus. From one moment to the next the crowd became silent as the judge entered the arena. For this fight it would be Ferine The Capricious. No one knew how she would react to the scene. Would they need a new fighter? Maybe even a new announcer? Ferine just laughed and with a wave of her hand Nilrem was thrown out of the arena and into his booth. In step four you have your first choice to make. Place one, two or three bets. Depending on the judge, the fighters and your cards that choice can be pretty tough. On the more fighters you bet, the less money you get if you win. It is important to know that you don’t really bet money. You have five betting tickets (with numbers from one to five). They represent the fighters. So you choose one to three of them and set the other betting cards aside. You won’t need them till the next round. As to most rules there is one exception. One of the spell cards can change your own betting ticket, but only if you bid on more than one fighter. The bookies were running around collecting the bets and handing out tickets. Of course only they knew who bet on whom. And even a mighty mage couldn’t get them to tell their secrets. Not in the great arena. In phase five the action and fun begins. You finally get to cast your spells! As you are a great but slightly senile wizard, you can’t choose from all the spells. You have drawn spell cards from three categories. Enchantments are spells targeted at fighters and always played face down, so only you know what is played. An example for an enchantment is Haste, which gives the fighter +4 power. Then there are direct spells, for example fireball, which gives -4 power. Direct spells are always played face up. The last type of spell is the support spell. As long as it is not enduring, support spells are discarded after they are resolved. Support spells are really powerful because they can even change the judge or the fighters. Each spell has a mana component. It might look like the “cost” of the spell (like you know from RPGs), but there is no limit to the spells you can cast, the mana cost only matters in the judgment phase. Everything could be so easy, if only there weren’t those damn judges. Nearly all judges have a mana limit, a judgment effect and spells they disallow. This means you and the other mages have to be careful not to “overcast”. Some cards have a negative mana value, but most add mana. If, in the judgment phase, there is more mana than the limit on a fighter, the judge either dispels all spells on the fighter or ejects him from the arena. You can use that to your advantage and get some fighters ejected or dispelled to help your favorite fighter. Back to casting spells. Starting with the start player each player can either cast a spell, use his detect magic ability (look at all the face down cards on one fighter) at the cost of discarding a card or pass. Like in many other games, if you pass you can’t do anything in the current round from that time on. The phase ends after all players have passed. Keep in mind that you can greatly influence the outcome if all other players pass before you. But on the other side you won’t have as many spells in the next round. Ferine The Capricious whispered a few words and began to ascend on unseen wings to her favorite spot above the arena. From here she would be able to see everything. If she wanted to. Today she would be a very strict judge. She lifted her hand and the fun began. As soon as the fighters saw the sign they began to attack one another. The Orc started to grow bigger and bigger. Every mage could see the blue-white light surrounding the massive figure. The Orc, now about six times his former size, smashed the Minotaur against a wall. For the moment the Minotaur was knocked out. Still it was a sign of his not quite superior intellect that the Orc turned his back to the unconscious enemy. As he stood there, drinking in the cheers of the spectators, he didn’t realize that they were not only cheering for him: the Ghost was trying to seize the chance to bring him down. It wavered around the Orc and began to mercilessly attack the legs. The Orc didn’t really seem impressed. He looked down on the Ghost. He grabbed it. Normally the Ghost would have become completely incorporeal and therefore invulnerable to the Orc. But here? While the others were having their fun the Dark Elf was trying to slice the Succubus’ throat. In mid-swing she stopped. Again every mage could see the blue-white light crackling. The Dark Elf seemed to be completely paralyzed. The Succubus seeing her chance attacked without mercy and … we should get back to the others. Succubus fighting techniques aren’t for the feeble minded. After playing your spells it’s time for the judgment. In this phase all face down cards are revealed. If a fighter exceeds the mana limit, he or she gets dispelled or ejected. Dispel means all spell cards are discarded and the fighter only gets his base attributes. Then the results of the round are determined. 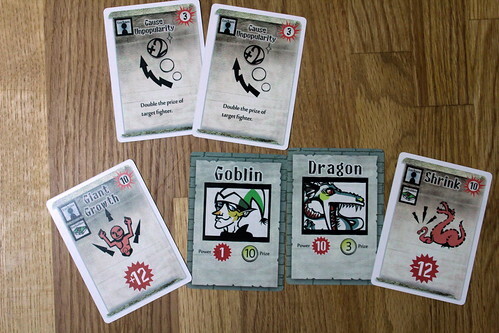 Remaining spell effects are added and the fighter with the highest power is the winner. Every player shows his betting cards and winners get their prize money. As the Ghost was stretched beyond recognition the Judge at last did her job. From one moment to the next the blue-white light surrounding the Orc vanished and he shrank down to normal size. Meanwhile the Minotaur was regaining consciousness. Attentive spectators might have seen the wounds on the Minotaur closing. They might have seen the muscles of the monster grow. But neither the Orc nor the Ghost had been very attentive. The Minotaur grunted and rushed the Orc. The Ghost saw its chance and brought its hands to the Orc’s neck effectively choking him. A fireball hit the Ghost in the back, shredding its form. As the smoke cleared there were only two fighters left. The Ghost was gone. So was the Orc. The Minotaur hat stomped him in the ground. The Dark Elf was only an empty shell. The Minotaur and the Succubus rushed towards each other. Cheering and absolute silence from the audience took turns. Until there was a loud scream from high above. Everyone looked up to see Ferine The Capricious getting sucked into a Dimension Door. In her place Tad The Daydreamer shuffled out. And then all bets were off. The only Judge who wouldn’t do a damn thing about magic in the arena. Phase eight: Draw cards according to number of players and don’t exceed your hand limit. Phase nine: End of round and the next one can begin. After three rounds the game is over. Winner is the player with the most money. Larry Leipzig was already shredding two of his three tickets. It couldn’t be any worse. He had given everything he could. He even regenerated the Dark Elf. But she was down again. He was about to turn around and walk away when suddenly the temperature in the arena dropped. Snowflakes were falling and wind got up. Soon the arena was wrapped in a full blown blizzard. After the wind died down there was only one fighter upright. Larry squinted his eyes. The remaining contestant seemed awfully small. Wait that couldn’t be! There was a Goblin in the arena. Absolute silence followed. Someone had to have cast a Metamorphosis! Tad The Daydreamer yawned then waited a moment. Then he harrumphed and again waited a moment. Finally he proclaimed the Goblin winner. The following booing didn’t end until Nilrem the Announcer`s voice boomed out of his booth. 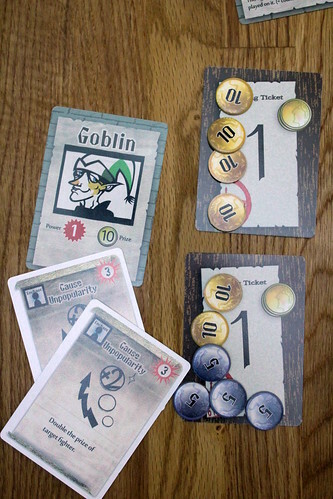 The Goblin was the winner. And the winning ticket would therefore be Number Three. The former Dark Elf. Larry’s eyes bulged. That was the first ticket he had shred. Some days you lose … some days the others win. But Larry wouldn’t be himself if he couldn’t learn from this. He was beaten. Again. But he wouldn’t give up. He had friends. They would help him. He might be back in square one but in the end he would finally win, big time! The game is quite fun. It has a high replay value that it mainly derives from the guessing and bluffing about everyone’s spells and intentions. In my opinion there are not enough fighters, only ten in all. Even with the reshuffling you get the same combinations every few rounds. Yes, your spell cards change and so does the judge, but that’s not quite enough for greedy old me. Only ten fighters is all the more sad for the very unique card art: not elaborate, but very charming in its way. With this game I learned one very important thing. Read the f…ine manual! Even the Rule Appendix! I was asking myself … why the deeple (that’s a devil meeple, kids) do I need the two coins I get at the beginning? You need them because of the Foul Play-rule for the last round. You can use your coins now to bribe the judge. This allows you to also play disallowed spells. We’d have saved ourselves some discussions if we’d read that rule before the first game. Addendum: Some elements of the game had to be a tiny bit changed for the story. If you find the discrepancies feel free to comment on them and proof your knowledge of the game!